In the human body, arteries take blood from the heart and transport it to the body’s extremities. Veins, which have one-way valves will transport the body’s blood throughout the body and eventually back to the heart. If the body’s valves do not function properly, then the blood doesn’t flow effectively throughout the body. When this occurs, veins can become enlarged since they get congested with blood. When these veins become enlarged, they lead to conditions called varicose veins or spider veins. Spider veins are red or blue veins that can be seen on the skin’s surface and are given their name because they protrude out like a spider web. 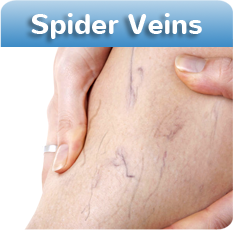 Varicose veins on the other hand are bigger veins that are located deeper within the skin than spider veins, and will appear to be protruding from the skin. WHAT ISSUE CAN VARICOSE VEINS CAUSE? Varicose veins can cause a variety of issues with your body, including the feeling of having heavy tired legs, throbbing in the lower extremities or general aching. Most likely this will be felt after prolonged sitting, standing or sessions of inactivity. Additionally, symptoms are typically worse at the beginning and end of the day. More symptoms of varicose veins can be ankle swelling & enlargement, restlessness in legs, cramping, itchy feelings, and potentially a red rash on the top layer of the skin. In some cases you may notice dark pigmentation on the lower part of your legs or potentially a congested purple coloring of the feet. The most perilous problem with varicose veins is varicose ulcer. These appear as a direct result of varicose veins. If you have noticed these symptoms on your body, simply make an appointment for a consultation. 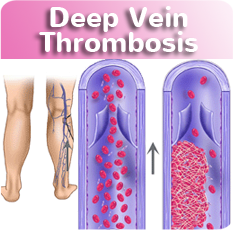 DO ALL VARICOSE VEINS REQUIRE TREATMENT? Although varicose veins are not a life-threatening condition, most people with symptoms (such as aching) notice an increased quality of life after vein treatment . Or if you are symptom-free but dislike the appearance of the veins, you may choose treatment for cosmetic reasons. One of the advantages of non-surgical treatment is that there’s no ‘down time’, other than the actual treatment session. You can get back to your normal routine virtually straight away. There are some exceptions – such as sport, heavy lifting and flying. You’ll be given easy-to-follow instructions for your post-treatment care. 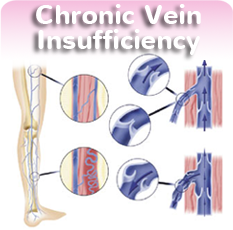 As a hereditary medical vein condition – varicose veins tend to run in families. In both men and women, but are more frequent in women. Oestrogen may play a role in varicose vein development because both puberty and pregnancy often seem to start varicose veins. During pregnancy the enlarged uterus can restrict blood flow out of the legs putting pressure on the veins, and cause varicose veins. As a result of occupations with prolonged standing, varicose veins can occur. One of the most common questions that we get asked is: What is the recommended treatment for a vein condition? The answer can vary depending on the specific condition or result that the individual wants to achieve. Typically if the results that the patient is trying to achieve are cosmetic we will apply a different procedure compared to if the patient is looking for pain-relief. In general though, there are two (2) treatment options: conservative approaches, which include compression socks or sleeves, and then corrective methods, which include sclerotherapy, and light/laser treatments. In certain cases, our Doctor may recommend a combination of treatments in order to produce the best possible results. Sclerotherapy is used for the treatment of varicose and spider veins. Scleroptherapy begins with a small needle being used to apply medication into the vein that irritates the lining of the vein. As a response to this medication, the veins begin to collapse and the result is that they are reabsorbed. The veins also diminish in size and will be no longer visible on the skin. Sclerotherapy is a popular procedure with very little down time that is known to relieve the symptoms of varicose & spider veins. With this type of procedure, veins can be treated at an early stage, which helps to prevent complications down the road. Ultrasound-guided sclerotherapy is a treatment that we offer at our office that is an alternative to vein stripping. With this ultrasound-guided technique, sclerotherapy is performed while the doctor monitors the vein using an ultrasound. This type of treatment enables veins that are unable to be seen because they reside below the skin. In most cases, you will not require a doctor referral. If you have any questions though make sure to contact us before your appointment to ask any questions regarding your insurance. Nearly every type of insurance covers treatment of varicose veins & venous insufficiency. However, treatment of spider veins is often considered a cosmetic procedure and is not able to be covered by insurance. If you need assistance determining what is and isn’t covered by insurance, call our office to speak with one of our dedicated billing specialists. During this procedure you will not feel any pain during the laser portion of your treatment. At Vein Clinic CA, we use the latest technology which includes a needle-free numbing to help reduce pain (and anxiety) of having a treatment performed. HOW LONG IS RECOVERY TIME? Our laser procedures are minimally invasive, and have little to no effect on surrounding skin tissues. This helps to keep the recovery time short and reduce the amount of discomfort compared to other more traditional methods like vein stripping. Once you come in for your evaluation and are presented with the treatment options for your specific condition, both spider & varicose veins can be treated with a level of effectiveness (and safety) that was previously unattainable. Results vary on a case by case basis, but our professional, trained medical staff has a track-record of producing great results for our patients.